In this video we speak with the artist Ed Atkins about his artwork No-one is More “Work” than Me, 2014, which he conceived for the Live Art Exhibition 14 Rooms in Basel (Switzerland). Ed Atkins: No-one is More “Work” than Me, 2014. 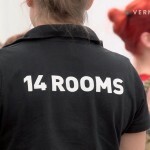 14 Rooms Live Art Exhibition. Messe Basel, Basel (Switzerland), June 12, 2014. On a large unadorned flat screen a 1:1 scale 3-D head, shaved and tattooed, bids for his humanity. A real-life person is present, performing according to the directive to “bear witness to” the avatar’s six-hour pitch at being a convincing person. Ed Atkins makes work in the process of life’s mediation through contemporary digital technologies: where and how bodies and beings are represented, to themselves and to others, and in what way our experiences are more or less verifiable, fed back to an embodied and immanent self. Using CGI, HD video, and audio he explores these possibilities by explicitly generating life-like imagery and effects to underscore the mortal and irrecoverable aspects of experience, resisting the material deferral innate to digital technique.